Modern 2 bedroom, 2 bathroom bungalow with stunning Mountain views. Pinhoti [pin-ho-tee] is located within the tranquil hills and valleys of the Appalachian Mountains of North-West Georgia. Situated on the crest of the immediate ridges, it has breath-taking panoramic views of Lookout and Pigeon Mountains and Taylor Ridge where you will find the famous Pinhoti Trails. The property is a new construction and was completed June 2018. It sits at the end of a long private dirt and gravel road on its own secluded 12 acres of woodland. As you drive up the inclined access road you start to get a feeling of the surrounding landscape and the privacy of Pinhoti. From the front the property may appear quite humble and modest; but as soon as you walk through the entrance door the imposing majesty of Pinhoti comes to life. Boasting floor to ceiling windows on the South-East elevation, the spacious main living area is flooded with light creating the perfect place for you and your family to relax and enjoy the wonderful landscape. There is comfortable seating with a sofa and lounge chairs together with dining facilities. A feature wall includes a 55” 4K Ultra HD Smart TV with satellite channels and for added ambience, a 58” remote control LED Electric Fireplace. The two bedrooms are accessed either side of the main living area. Both are similar in style and size and also boast floor to ceiling windows, filling the rooms with light and the views. They have walk-in closets and Bathrooms with full-size showers. Throughout the winter months these large glazed areas capture the sun’s energy, providing the home with the most environmentally friendly warmth without the need for supplementary heating during the day. The Kitchen and Breakfast Bar form part of the open plan living area. Including a full-size range, double refrigerator with ice maker/water dispenser, microwave, dishes, pots, dishwasher, blender, coffeemaker and toaster. Just about everything you would want home-from-home in the kitchen. The large pool deck is accessed through patio doors from the main living area. 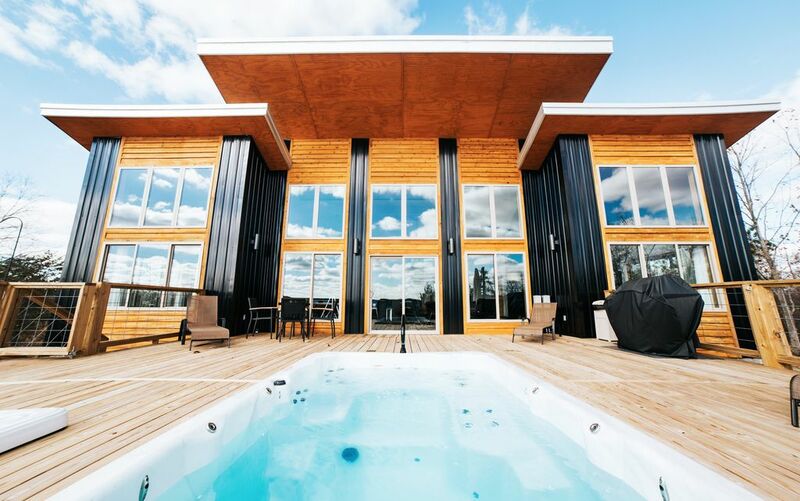 Here you can enjoy our ‘ALL YEAR ROUND’ heated in ground swim spa and separate hot tub. The swim spa has the option to provide a jetted resistance current which allows you to swim against, providing fantastic exercise and entertainment for young and old. Or just simply relax and experience the feeling of well-being in the warm waters and hydro massage jets of the separate hot tub. In the evenings, as the sun starts to set, get hypnotised by the sounds of the Whippoorills and the sleepy sounds of the Katykids as you cook on the outdoor gas BBQ grill. Be sure to walk the peaceful, wooded trails on our secluded 12 acres and take in the natural wildlife from birds and butterflies to the majestic deer. If you are lucky, you may see some wild turkeys. 'Pinhoti', the name we chose for our bungalow means 'Turkey Home' in Creek Indian. For our less abled guests, young or old, we have tried our very best to ensure that moving throughout the property is accessible by having everything on one level. Whatever you choose to do with your time, relaxing, hiking or sightseeing at the many nearby attractions, rest assured, you will make many wonderful memories at Pinhoti. Located 50 minutes from Chattanooga, 2 hours from Atlanta & Birmingham, 40 minutes from Cloudland Canyon & De Soto Falls. - Completely private heated 14ft Swim Spa/pool (All year). - Hot Tub (All year). - 2 spacious bedrooms with comfortable mattresses to accommodate 4 people. - 55” 4K Ultra HD Smart TV with satellite channels. - 58" Wall mounted LED Electric fireplace. - Fully-equipped kitchen, full-size stove, double refrigerator with ice maker, microwave, dishes, pots, dishwasher, blender, coffeemaker and toaster. - Laundry Room with full-size separate washer and dryer. - Linens and towels provided. - Fully furnished and tastefully decorated in the style of a contemporary home. -12 acres of peaceful, private & secluded land. We love this area of Georgia and built our first family vacation home, close by, completed June 2005. We have been offering this property for vacation rentals since 2011 so please check-out the reviews we have received over the years so that your feel comfortable renting our newest addition ‘Pinhoti’. 'Peavine Lodge' - VRBO 350505. We are Angie & Andrew, the proud owners of Pinhoti and we live in Hampshire (South Coast), England. We have three sons, Charlie 27, George 25 and Elliott 19. Our family also includes two dogs, Stanley and Maggie and our 15 year old cat, Oscar. In 2005 we fell in love with North-West Georgia after a vacation with our young sons and were excited to have the opportunity to purchase land close by to Pinhoti and build a home on which we started sharing with guests in 2011. Last year, we were fortunate enough to be able to build Pinhoti, and here starts our latest adventure. Hopefully, our now grown sons will be able to bring their families here and enjoy the beauty of Georgia they all enjoyed as children. The peaceful sunrises, majestic sunsets, playful hummingbirds and the stunning views are just a small part of what made us fall in love with our home. Spending time with family chatting, eating outside and just enjoying our time away from the stresses of every day life make for beautiful memories. toilet, shower, Shower is walk-in , accesible for less abled. toilet, shower, Shower is walk-in, accessible for less abled. Both bathrooms are identical. They include toilet, sink and walk-in shower suitable for guests that may be less abled. Nightlights in both bathrooms. Leather Sofa and 2 comfy chairs, coffee table, wall mounted Smart TV and electric fireplace. Small amounts of detergent supplied. Double door fridge/freezer with ice and water dispenser. Ground Coffee machine and Keurig 'pod' coffee machine. We will endeavour to keep the pantry stocked with small amounts of condiments, spices, coffee, dishwasher and laundry detergents, paper towels, toilet rolls, guest soaps, foil, etc.. Dining table and 4 chairs. Breakfast bar in kitchen with 4 stools. Card games and board games. Natural lawn immediately surrounding property. In ground spa pool and hot tub, Table and chairs and sun loungers/parasol for 4 people all on the same deck. Public Tennis courts are in Trion and Lafayette. Local golf courses located in Trion & Lafayette. Where possible, we have endeavoured to make our home accessible to those less abled by keeping everything on one level with open spaces and doorways accessible to wheelchairs. The Spa pool and Hot Tub both have a hand rail to help with access and both large shower enclosures and moulded corner seats with a fixed and detachable shower head. 'ALL YEAR ROUND' 14ft heated in ground swim spa (optional jetted resistance current for swimming) with built in seats and lighting and hand rails to help with access. Large in ground Hot Tub. BOTH POOL & HOT TUB HAVE REMOVABLE HARD COVERS FOR SAFETY. THESE ARE NOT SUITABLE FOR STANDING ON. PARENTS SHOULD ALWAYS SUPERVISE CHILDREN IN POOL AREA. We loved everything thing about this place. Just what we wanted for a quiet get away from it all weekend. I would suggest you stop at the grocery store when get off the highway as this is a bit off the beaten path, but the kitchen is well stocked and it's easy just to stay put! So lovely to hear you had a great time. Yes, we always stock up on groceries before we arrive, then we know we can just kick back and relax. Hope you can return some time in the near future. Home was exactly as depicted. Views are spectacular. Every day the Mountain View is different, depending on the weather. It really is a special place. Well equipped kitchen- we needed nothing but our food, clothes and toiletries. Enjoyed the deck, even in the rain! We hope to come back soon! Thank you Alisa for being a great host and to the owners for sharing their home! Home is beautiful and views are amazing! Kids enjoyed themselves! Very relaxing! A few little hiccups but manager was great and accommodating! Hope to return soon! Stunning, clean, contemporary home - Just Perfect ! We were lucky enough to spend 5 days at Pinhoti recently and we weren't disappointed. Not only was the house clean and fresh with everything we could possibly need, the views of the Ridge were breathtaking. We enjoyed walking the trails, sitting by the firepit and especially the heated spa pool and hot tub. Looking up from the hot tub in the evening and seeing all the stars over us was just beautiful, we don't get to see stars like this in the city. We even played with the cards and board games supplied, we haven't done that for years - and we hardly looked at our phones ! If you want to get away from it all, kick back, take time just to talk and enjoy each others company, this is certainly the place to stay. We are already planning our return in the summer months, we can't wait.! Highly recommended.! Thankyou for your lovely review and we are very pleased that you got to enjoy Pinhoti. I agree with you about leaving those phones to one side and actually talking to each other ! Hope to see you in the summer. So glad you enjoyed your stay at Pinhoti and it's lovely that you would be happy to recommend us, Thankyou. We hope to see you again in the near future. Great place! Love the design and decorating! Lovely to hear you enjoyed your time at Pinhoti. We had great fun with the team designing this project. We hope you can return some day. Lookout Mountain (TN) which is approximately 37 miles away is a great place to explore. It is home to the famous Rock City Gardens where you can see seven states from the top viewing point. At the bottom of the mountain is Ruby Falls Caverns and the very popular Incline Railway which takes you 1 mile up the mountain to Point Park where there is a historical Civil War State Park. Drive a further 15 miles and you will be in Chattanooga. Here you will find the impressive Tennessee Aquarium, Imax theatre, Baseball Stadium, various Tennessee River cruises, paddle-boarding, restaurants, bars, shops and the famous Chattanooga Choo Choo, all within walking distance once you have parked up. James H Floyd State Park (14 miles) is the perfect place for a family day out for a picnic, walking and paddle-boating on the beautiful lake. Little River Canyon State Park , Alabama (30 miles) is very popular with the youngsters for swimming in the pools that form at the base of the waterfall. There are some great hikes here too and picnic areas at the start of the park. Closer to Pinhoti is Station House of Lafayette restaurant (8 miles). It has a friendly atmosphere with fantastic, reasonably price food. We have enjoyed eating with friends there many times. The above rates are for 1-4 Guests; 4 night minimum on July 4th, Thanksgiving and Christmas/New Year. Pool heat included. Cleaning fee and County and State Taxes extra. $250 refundable Deposit to be added to rental.